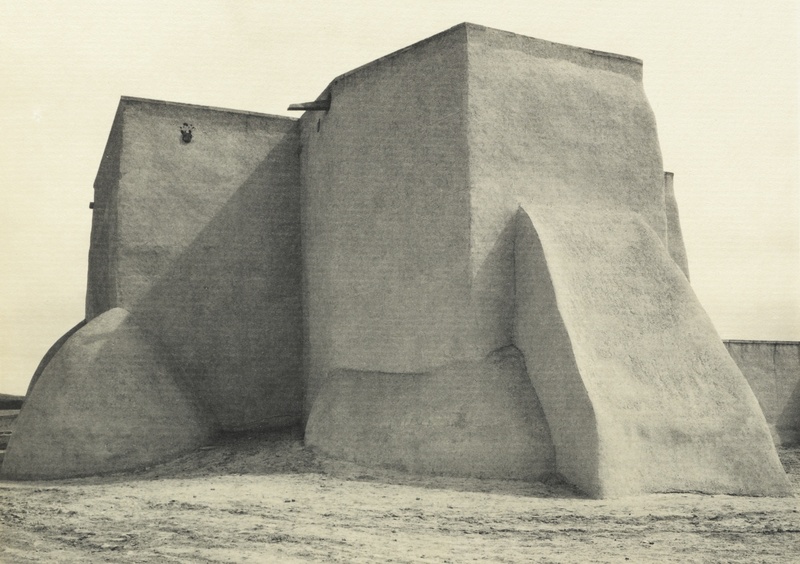 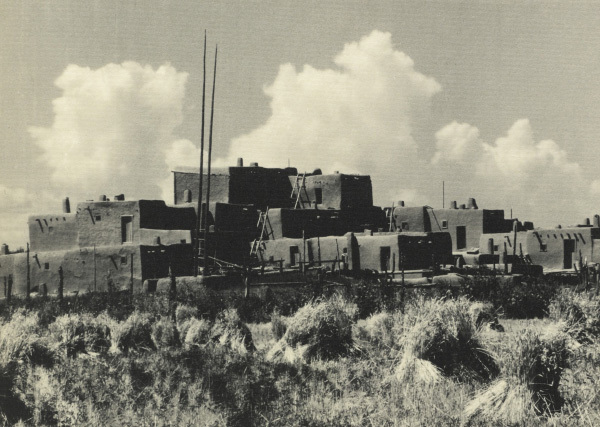 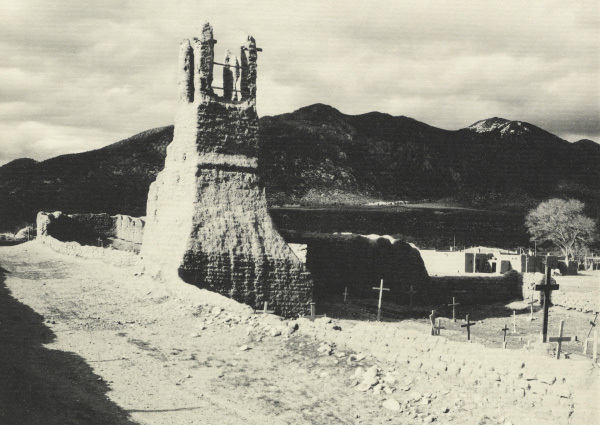 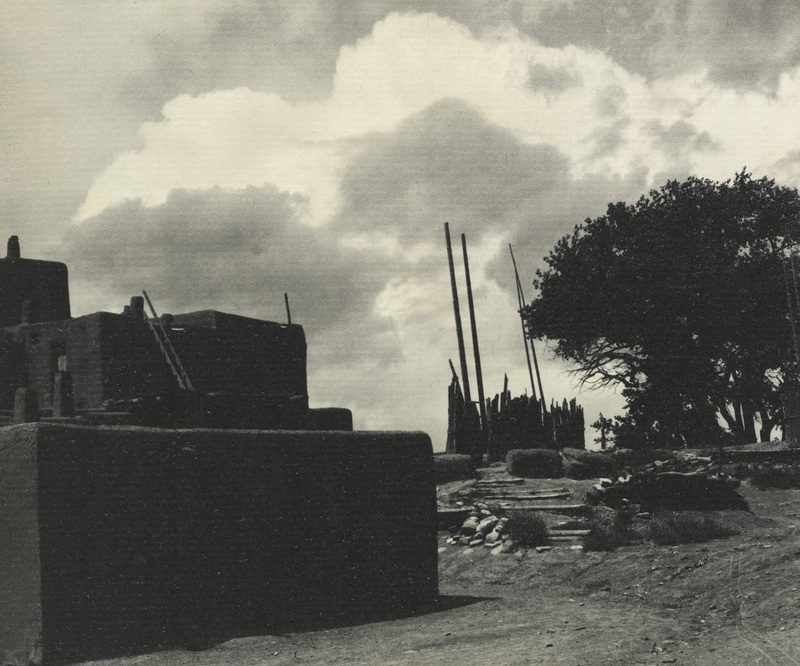 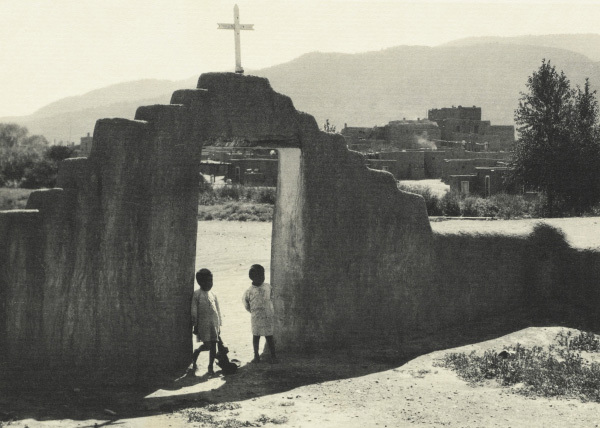 Taos Pueblo, a collaboration between young Ansel Adams and Mary Austin, was produced in 1930 in a small edition of 108 (this copy is editioned 41 of 108). 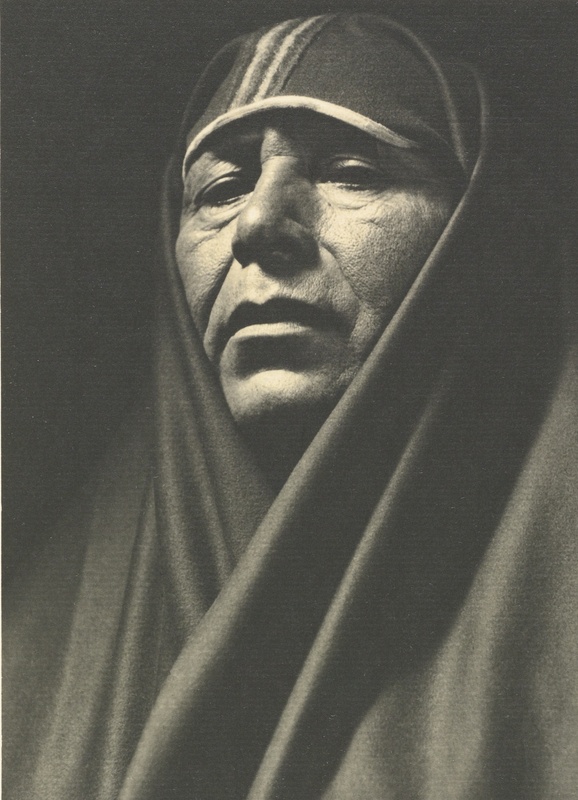 Exceedingly rare, it is considered one of the greatest books produced by the Grabhorn Press. 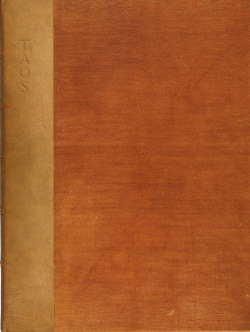 The 17" x 12 ½" folio is hand bound in original quarter tan morocco over orange buckram by Hazel Dreis with six preliminary pages followed by fourteen pages of text. 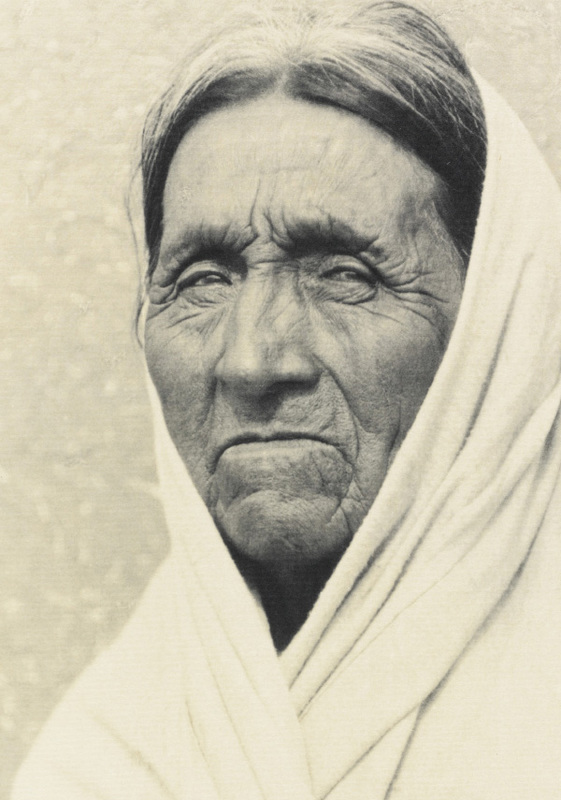 The following twelve original silver bromide prints were hand printed by Adams himself on rag paper specially sensitized with emulsions by William Dassonville, his San Francisco paper supplier (Adams had to produce manually 1296 silver prints for this project!). 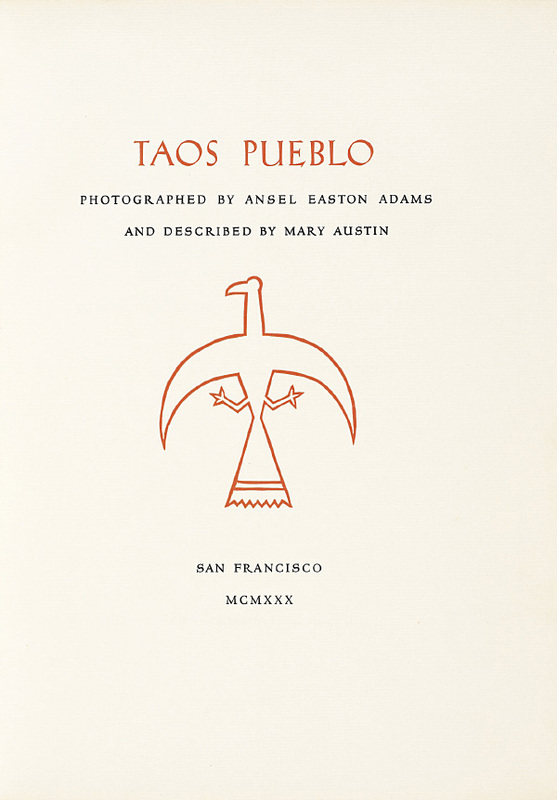 The manuscript pages were enhanced by a beautifully designed Indian Thunderbird motif by Angelo Valenti, an Italian-American printmaker, illustrator and author. 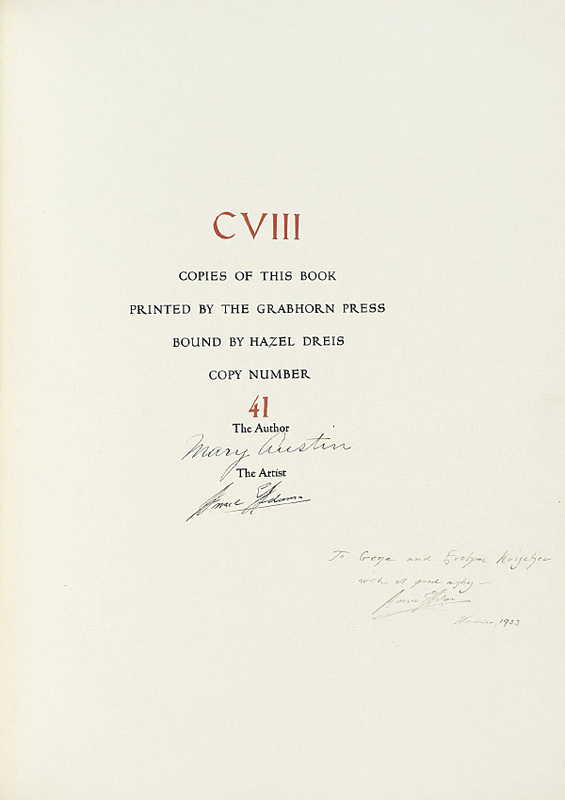 Signed by Mary Austin and Ansel Adams in ink in the colophon and dedicated by Adams to the Krischers. 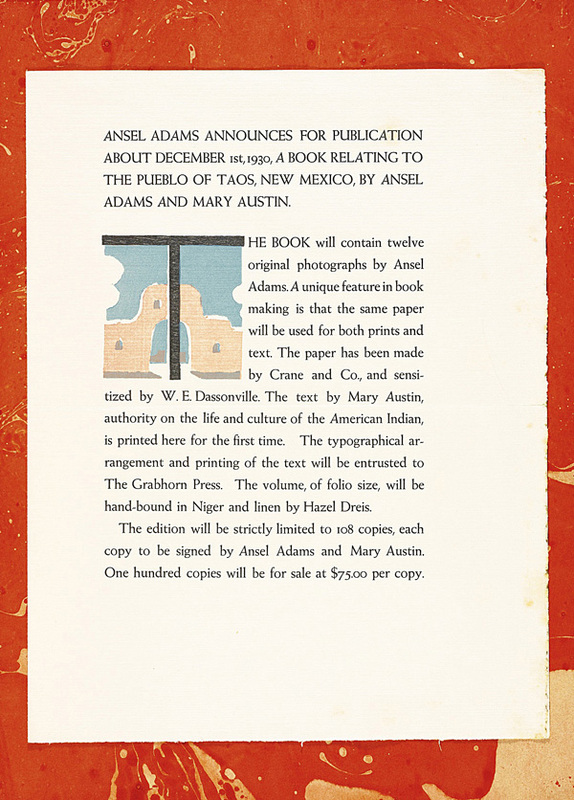 In a letter to a friend Adams wrote "With Mary Austin writing the text… I have a grand task to come up with the pictures." 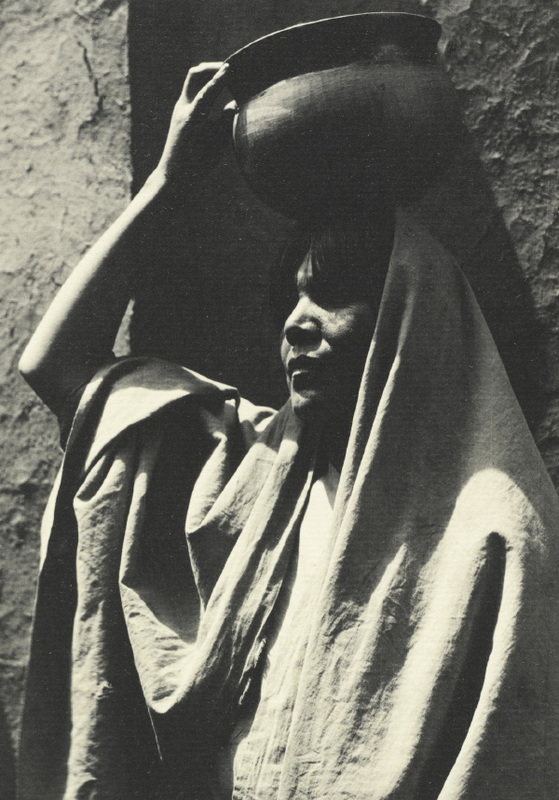 However, Austin wrote her text, which has itself been described as photographic, without seeing the images. 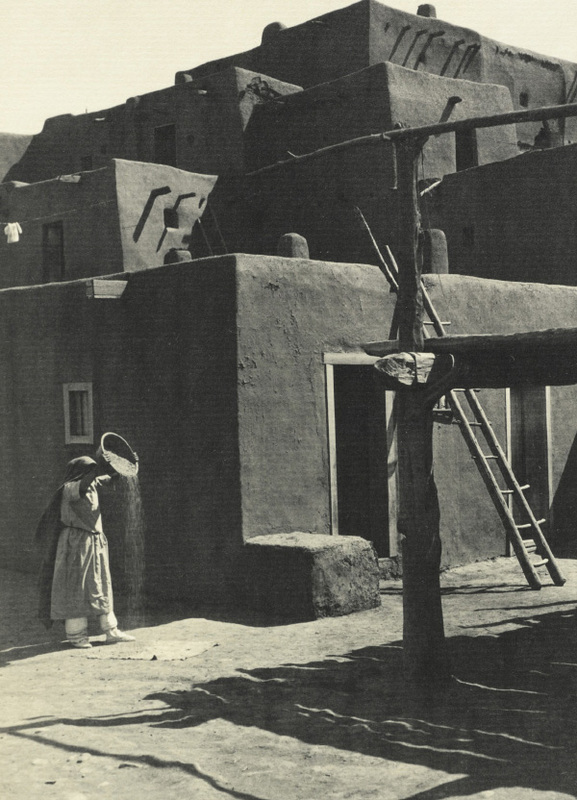 Beth Capo, in a paper presented at the annual meeting of the American Studies Association Annual Meeting, in Albuquerque, New Mexico, examines the product of their collaboration through the interdisciplinary lens of American Studies which offers multiple angles on the intersection of not just two careers, but of the American environmental movement and a movement by white women to promote Pueblo arts. 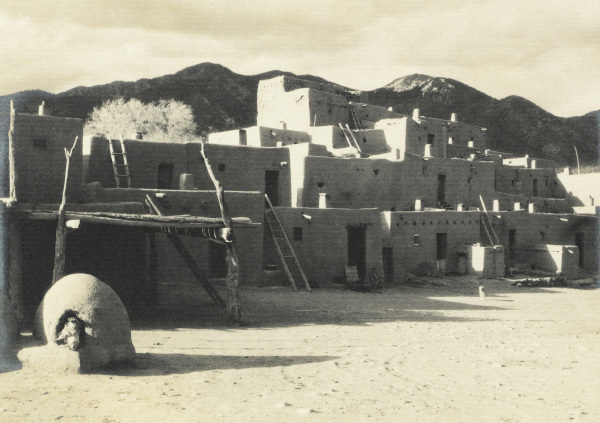 Austin wrote several "Ecofeminist" works depicting Native Americans of the Southwest, their folktales, poetry, and rituals, in her fiction and nonfiction. 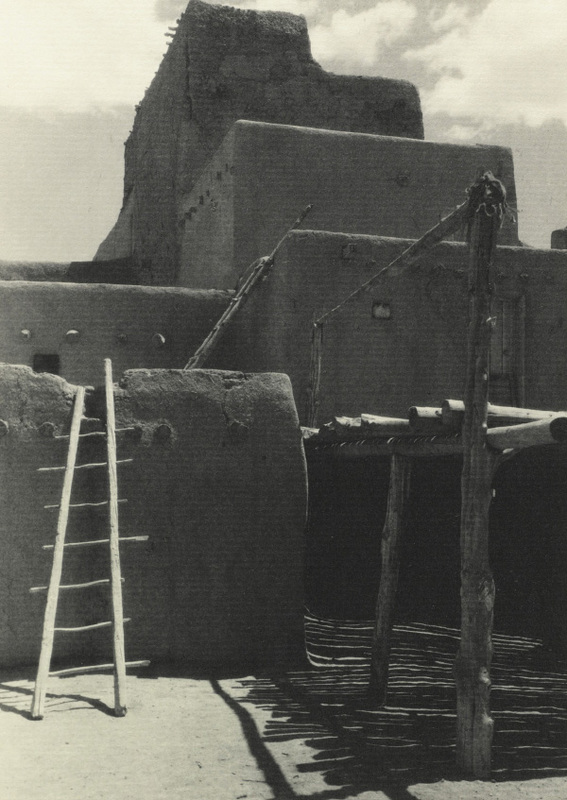 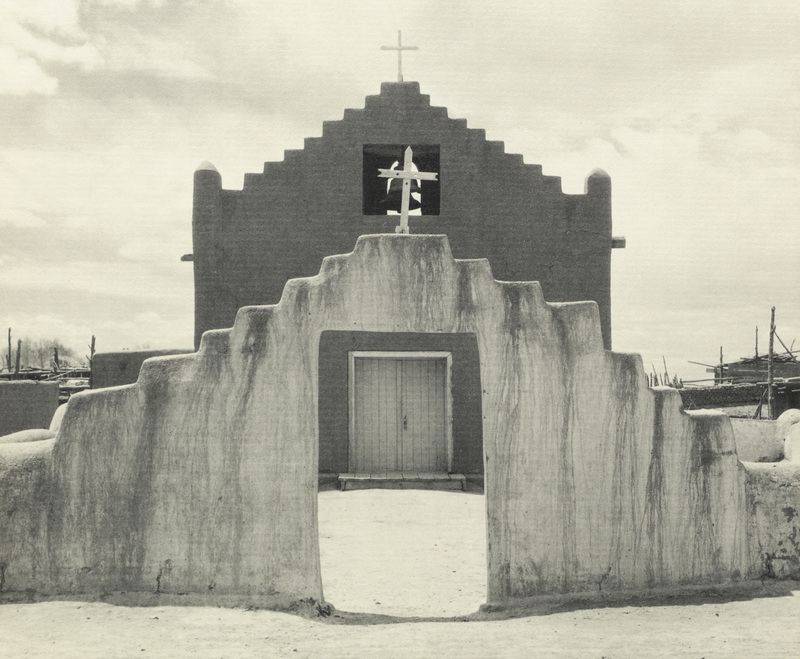 The following images below, including frontispiece, title page and colophon in addition to all twelve Adams' photographs, take you on a pictorial journey through the crude yet elegant pueblos of Taos and of some rugged characters that inhabit them.